[http://www.digital-digest.com/software/Nero_Vision.html Nero Vision] is included in the [http://www.digital-digest.com/dvd/downloads/showsoftware_nero_417.html Nero Ultra] edition, a collection of commercial software from Nero. * Many advanced features are accessible through the control panel/home features of the software suite. TMPGEnc DVD Author is a commercial application (trial version available), and it also includes DivX Authoring. [http://www.dvdr-digest.com/software/powerproducer.html Cyberlink PowerProducer 4] is a commercial application (trial version available), and it also includes DivX Authoring. [http://www.dvdr-digest.com/software/tmpgenc_author.html TMPGEnc DVD Author 3] is a commercial application (trial version available), and it also includes DivX Authoring. 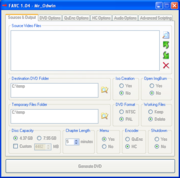 [http://www.digital-digest.com/software/favc.html FAVC] is an free video to DVD conversion and simple authoring tool. It can make DVDs with simple menus. It uses either HC or QuEnc as the MPEG-2 encoder, and it produces quite good quality DVD folders or .iso images ready for burning with ImgBurn or another DVD burning tool. * You can't beat the price! [http://www.digital-digest.com/software/dvd_flick.html DVD Flick] is an free open source DVD authoring tool, designed to make really simply (menu-less) DVDs. The biggest problem with this tool is that it can be very buggy at times. [http://www.divx-digest.com/software/divxtodvd.html ConvertXtoDVD] is a shareware DVD authoring tool, designed to make really simply DVDs with basic menus. It is similar in nature to DVD Flick, but with a few less rough edges. [http://www.digital-digest.com/software/dvd-lab.html DVD-Lab] is a shareware DVD authoring package that is available in both standard and Pro versions. The standard version is aimed at new users who are somewhat experienced in using video tools, while the Pro version is semi-professional in usability and professional in terms of features. This page has been accessed 125,797 times.